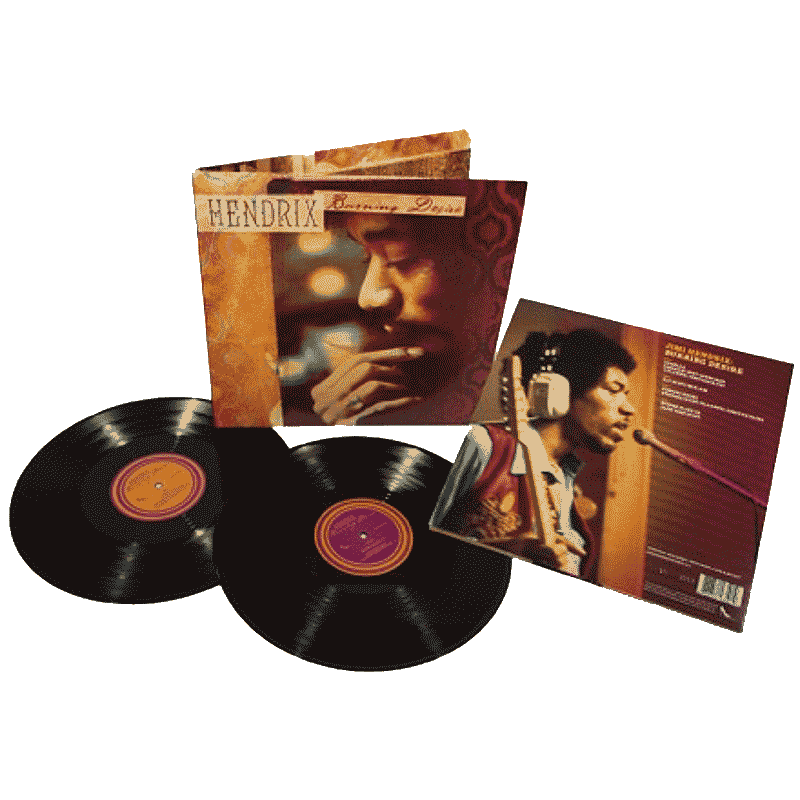 In celebration of Record Store Day”s “Back To Black Friday” event, Experience Hendrix L.L.C., in conjunction with Legacy Recordings, is releasing the official “bootleg” Burning Desire, a 2 LP set of rare Jimi Hendrix studio recordings issued under the Dagger Records imprint. Dagger Records was started by Experience Hendrix in 1998 as an official “bootleg” label whose releases would provide Hendrix”s fans throughout the world with additional live performances, home demos and studio recordings not issued on commercial albums or sold in retail stores. Burning Desire is the twelfth release by Dagger Records. It will be available in record stores for the first time ever on November 27 (the day after Thanksgiving). Burning Desire presents compelling new examples of Jimi Hendrix”s remarkable creative explorations between November 1969 and January 1970. Like its Dagger Records counterparts Hear My Music (released for last year”s Record Store Day Black Friday event) and Morning Symphony Ideas, this package provides a window into Hendrix”s growth as a musician and composer. While Hear My Music focuses on recordings from early 1969 with the original Jimi Hendrix Experience (including bassist Noel Redding and drummer Mitch Mitchell), Burning Desire presents exciting explorations made with a newer rhythm section consisting of bassist Billy Cox and drummer Buddy Miles. Recorded at the Record Plant in New York immediately before and after the four legendary New Year”s Eve/Day Fillmore East concerts that produced the live album Band of Gypsys, Burning Desire sheds light on Hendrix”s nature as a prolific songwriter and producer with a limitless ability to create. Songs such as “Izabella,” “Villanova Junction” and “Stepping Stone” were among the brightest examples of Jimi”s new music. Burning Desire also features the extraordinary “Ezy Ryder/MLK Jam” and “Record Plant 2X,” which showcases some of Hendrix”s finest ever guitar playing in full flight. November 27 marks the debut vinyl release of Burning Desire. The double LP package has been pressed on 150 gram vinyl by Quality Record Manufacturing (QRP). The first 5,000 copies will be numbered. This collection is essential for both diehard fans of Jimi Hendrix and those interested in his continuing development as an artist during the final year of his life. Now in its eighth year, Record Store Day is an annual day-long celebration of record store culture taking place on the third Saturday in April, with an annual Black Friday event occurring the day after Thanksgiving. Dagger Records was established by Experience Hendrix L.L.C. in 1998 specifically to release “bootleg” recordings which further detail Jimi”s illustrious legacy. Dagger releases are normally not available in brick and mortar record stores, as all other titles are sold online via jimihendrix.com. Experience Hendrix L.L.C. is a major supporter of vinyl releases and the bi-annual Record Store Day celebrations. Other releases in the Dagger catalog include Live In Cologne, Live At Woburn, Live In Paris & Ottawa 1968, Hear My Music, Live At The Isle of Fehmarn, Paris 1967/San Francisco 1968, Baggy”s Rehearsal Sessions, Live In Ottawa, Morning Symphony Ideas, Live At Clark University and Live At The Oakland Coliseum.